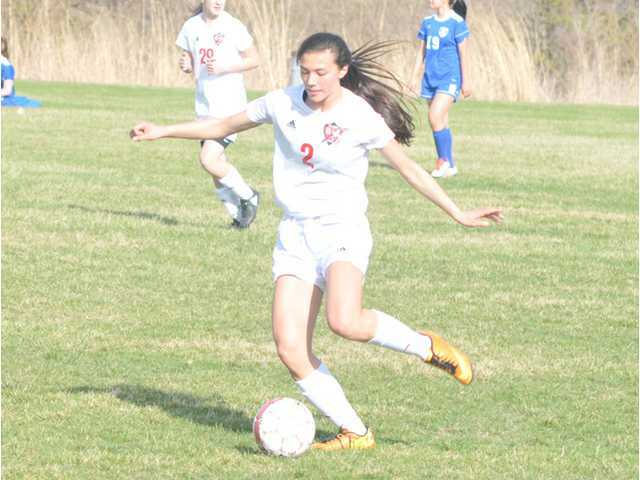 Lancaster junior Lydia Murphy scored a goal and had three assists in last Tuesday's 6–0 win at Richland Center to help Platteville/Lancaster clinch the outright SWC title. POSTED May 31, 2018 8:53 a.m.
RICHLAND CENTER — The Platteville/Lancaster girls soccer team clinched the outright Southwest Wisconsin Conference title with a 6–0 shutout at winless Richland Center last Tuesday afternoon. The Hillmen (9–5–2, 9–0–1 SWC) made quick work of the Hornets (0–13–1, 0–9–1 SWC), scoring five times in the five 31 minutes. Lancaster junior Lydia Murphy scored in the 22nd minute and assisted on three other first-half goals. Platteville freshman Tina Muzina and sophomore Sierra Hooper each scored twice in the rout. Alexis Thompson found the back of the next in the 12th minute to begin the scoring. The Hillmen closed out the conference season with a 2–0 shutout of host Prairie du Chien on Thursday. Murphy and sophomore Courtney Budden scored the Platteville/Lancaster goals in the victory. The Hillmen dropped a 6–0 non-conference decision at Mount Horeb Friday afternoon to close out the regular season. Coach Brandon Pink’s squad earned the nine seed in its WIAA Division 3 half sectional and will travel to No. 8 Monroe for a regional semifinal matchup on Thursday. First half — P/L: Alexis Thompson (Lydia Murphy) 11:29, Murphy (Sierra Hooper) 21:15, Tina Muzinga (Murphy) 24:48, Hooper (Murphy) 29:30, Muzinga (Jaelyn White) 30:16. Second half — P/L: Hooper (Shay Bainbridge) 75:33. Saves — P/L: Sami Knockel 0, RC: Cadence Starkey 6, Marybell Rodriguez 5. Shots on Goal — P/L: 17, RC: 0. Corner kicks — P/L: 3, RC: 0. Second half — P/L: Lydia Murphy (Tina Muzinga), Courtney Budden (Murphy). Saves — P/L: Sami Knockel 2; PdC: Tasha Eades 14. Shots on Goal — P/L: 2, PdC: 16. Corner kicks — P/L: n/a, PdC: n/a. First half — P/L: Olivia Yanna (Sydney King) 21:55, King 27:32, King (Maggie Conway) 42:03, King (Conway) 42:22. Second half — P/L: Conway (Gillian Anunson) 49:01, King (Liza Spellman) 62:02. Saves — P/L: Sami Knockel 11; MH: Grace Droessler 1. Shots on Goal — P/L: 1, MH: 17. Corner kicks — P/L: n/a, MH: n/a.